DAR ES SALAAM, Dec 22 2012 (IPS) - A nurse working in a remote clinic in Mueda, a small town in northern Mozambique’s Makonde Plateau, receives a shipment of vaccines from the national health department. Using special software on her mobile phone, she sends out a mass text message to alert mothers in the area about the availability of immunisations. She also uses the phone to schedule appointments, access patient records and order new vaccines when stock runs low. It is – for now – a theoretical scenario on how mobile technology can help improve childhood immunisation in sub-Saharan Africa. But it will soon become a reality in Mozambique, a country the size of Turkey, where 135 out of 1,000 children die before their fifth birthday. The southern African nation’s Department of Health has teamed up with the GAVI Alliance, a public-private partnership for immunisation, to launch a pilot project in about 100 clinics in early 2013 where health workers will test the effectiveness and cost benefits of using mobile phones to communicate with patients. The yearlong three-million-dollar pilot project has been co-financed by British telecommunications giant Vodafone and the United Kingdom’s Department for International Development. At the end of the trial, vaccination levels in Mozambique should improve by five to 10 percent, the donors say. “One thousand new mobile broadband connections are made every minute in the developing world, which means we have a tremendous opportunity to transform lives in an easily accessible way,” explains U.K. Secretary of State for International Development Justine Greening. Africa is the world’s fastest-growing mobile phone market and the second largest after Asia, according to Groupe Speciale Mobile Association, a global industry body. There are about 700 million mobile connections on the continent and the number of mobile phone users increased by nearly 20 percent every year over the last five years. Although not every mother in the poor nation of Mozambique, which according to United Nations statistics had a meagre gross national income per capita of 382 dollars in 2009, has a mobile phone, at least one family member or a neighbour usually does. As part of the pilot project caregivers will be registered on a health ministry database and will be educated and alerted by text message about the availability of vaccines and their importance. They can reply via SMS to schedule clinic appointments and will receive notifications and reminders about their children’s past and future vaccinations to make sure each child receives a full immunisation schedule. 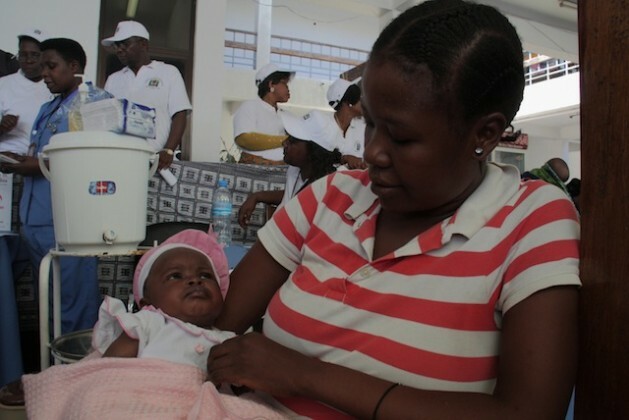 Mozambique’s health workers will receive smartphones with software to access records and schedule appointments and help clinics in remote locations monitor stocks to make sure vaccines are available when mothers arrive with their children. “Mobile technology will help us identify children who until now have been missed and make sure they get a full set of vaccinations,” GAVI CEO Seth Berkley tells IPS. The ability to notify and remind mothers of vaccination appointments is expected to make a big dent in high drop-off rates, where a child receives only one out of two or three necessary injections to make a vaccine effective, he says. According to the World Health Organization (WHO), immunisation is the most cost-effective public health intervention after the provision of clean water. More than a million children die each year from vaccine-preventable diseases, while every fifth child in Africa remains unimmunised, the organisation says. A number of other African nations have started to use mobile technology in some areas of public health care, although the Mozambican pilot project will be the most comprehensive when it comes to immunisation and will use software specifically developed for national conditions and needs. Tanzania, for example, uses mobile stock management technology to track malaria treatments in 5,000 clinics across the country. In South Africa, 1,800 remote community health workers use mobile phones to access and update patient records. And when Ghana rolled out rotavirus and pneumococcal vaccines this April, a major local religious organisation helped notify mothers about the new immunisations by arranging for 1.5 million SMS messages to be sent out. South Sudan, supported by the WHO, began to manage vaccine stocks through mobile technology in mid-2012 in its central and state stores, while Rwanda’s health ministry uses mobile phones to monitor maternal and child mortality. “The cell phone has been revolutionising (African) healthcare more than any other technology,” Richard Sezibera, Rwanda’s former minister of health and current secretary-general of the East African Community, tells IPS. Providing health workers with mobile devices “has really changed life in Rwanda,” he adds. The strategy has helped bring down Rwanda’s under-five mortality rate from 163 per 1,000 live births in 1990 to 56 per 1,000 live births in 2011, according to U.N. Children’s Fund figures. If Mozambique’s pilot project is successful, it will be expanded to 1,500 clinics across the country. If that works well, GAVI hopes to implement it in many other low-income countries in sub-Saharan Africa, Berkley says. Civil society organisations, which have been working to improve child health in those countries for years, believe the approach could make a huge difference to children’s lives.